COUTUREtime is the horological adjunct to the jewelry focused COUTURE trade show, which has taken place in Las Vegas for the past 13 years. As such, it was perfect vehicle to host us and our merry band of miscreants for a weekend of horological hijinks in Sin City. Mind you, this is a business-to-business show we're talking about, so bringing in a group of sixty or so non-industry collectors to walk the floor isn't quite as simple as issuing passes and calling it a day. To this end, we worked directly with COUTUREtime over the past year to create an experience that would appeal to our members and add some real value for the exhibitors and retailers who make the event home for a week. With the bulk of RedBar members showing on Friday, we didn't kick things off until the afternoon. After gathering at the RedBar Lounge for a quick orientation, we split up into three groups to visit Bell & Ross, Dior, Zenith and Hermes in the Villa suites. To say that everyone had a good time is an understatement of criminally gross proportions. Even the anteaters. Saturday kicked off bright and early with a breakfast hosted by Longines on the patio of their salon. In between generous helpings of French toast, coffee, fruit and more bacon than anyone could reasonably consume, we were treated to a presentation by Brand Director and President for North America, Pascal Savoy, on the history of Longines, their present collection, and where they're headed for the future. It goes without saying that the star of morning was the Hydroconquest US edition and the updated Legend Divers (my personal favorite is the PVD version, but I'm predictable like that). We couldn't have asked for a better way to kick off the first full day of the show, nor could we have asked for better hosts! From here it was back to the RedBar Lounge where we hosted what is fast becoming a tradition at COUTUREtime, our Bloody Mary Happy Hour. Given that it actually lasts two-and-a-half hours, we might want to change the name for next year, but we'll sort that out later. After an epic #sexpile shot, RedBar Members used this time to visit the other brand salons – drink in hand – while yours truly hosted the retailers and exhibitors who needed some hair of the dog to aid in the recovery from the previous evening's exertions. With the conclusion of the Bloody Mary Happy Hour, we set up for a panel discussion on the state of the industry with VJ Geronimo, CEO of Oris, North America; Fred Martel, President of Baume & Mercier, North America; and our host from the morning's breakfast, Pascal Savoy. It was a wide-ranging and frank discussion, which touched upon the challenges of operating in today's daunting economic landscape, the threat posed by the gray market, and the rising importance of North American marketplace. After a quick Q&A session, we headed over to a special presentation by TAG Heuer, which showcased the storied brand's history with chronometers and racing timing, starting with the first dashboard mounted chronometer created by Edouard Heuer and going all the way to the tech heavy quartz Microtimers. Next up was Grand Seiko, where we were treated to presentations by North American president, Brice LeTroadec; Seiko Corporation of America CEO, Akio Naito; and, finally, our good friend, Joseph Kirk, the Man when it comes to all things Seiko and all things Japanese whisky (yes, they shipped in a case of the good stuff just for our meeting, and it was greatly appreciated). Our last stop for the day was with Tudor, where brand president Russell Kelly had the presence of mind to fully cater our cocktail hour – this wasn't his first rodeo and he knew that we'd need a wee bit of ballast to steady ourselves after the mimosas, Bloody Marys, champagne, cocktails and Japanese whisky that marked our journey to his villa. The stars of the evening? The Black Bay GMT and Black Bay Fifty-Eight, both of which were on-hand to be fondled to our hearts' content. The food was more than appreciated, however, as Saturday evening was when the annual Oris party was scheduled to go down. It's important to note here that this is, like, their thing. For the past several years, the party of the weekend has been the Oris jam, and they've become exceedingly good at it. For COUTUREtime 2018 they partnered with us for their marquee event, which took place at Commonwealth, a speakeasy on historic Fremont Street. Now, it's given that we at RedBar also know how to throw a party, but in this particular instance Oris wasn't tapping us for our expertise. Rather, they included us so that we could jointly announce the debut of the Oris Divers Sixty-Five RedBar Limited Edition. Produced in a series of 100 pcs, the proceeds from the sale of watch, which is only available for purchase by RedBar members, will go to charities supported by our local RedBar chapters. Honestly, we couldn't have asked for better partners, a better watch, or, since we're here talking about it, a better party. Sunday morning saw most of us moving a wee bit slower than before, though for good reason, as the Oris event was a proper rager. Even so, we had a wonderful time with our friends at Parmigiani, Tutima, Corum and Raymond Weil. After that round of appointments, we stopped in to say hello to Oris – and our watch, which was on display – and then closed out the show with a three-fer courtesy of the combined might of Frederique Constant/Alpina/Ateliers deMonaco, where we were greeted by none other than Jeffrey Cohen, President for North America not only for the above brands, but also parent company Citizen. What can we say, other than "wow". 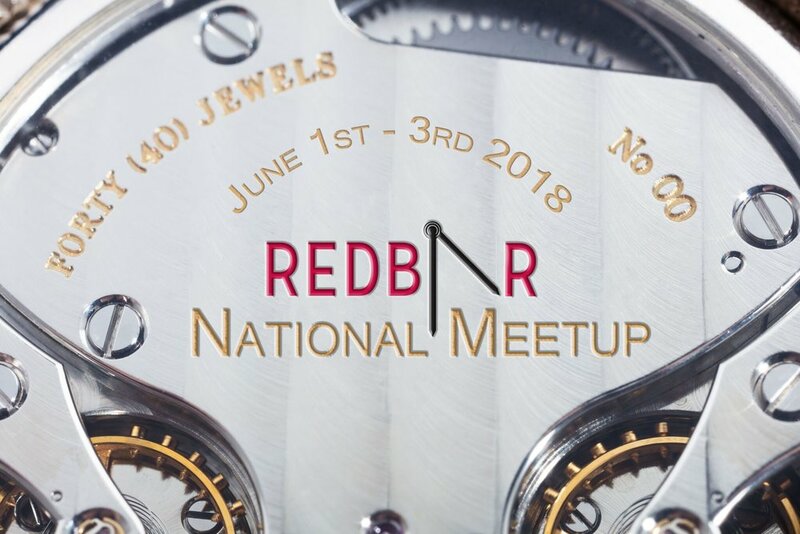 The RedBar National Meetup was a year in the planning, a weekend in the execution and we couldn't be happier with the results. Everyone had a wonderful time, and, though we may still be in recovery mode, we already can't wait to do it bigger and better for next year!